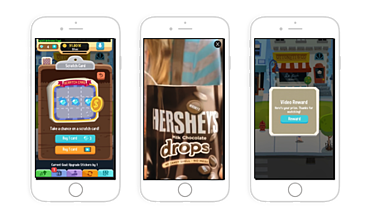 Run mobile video advertisements that achieve 200% viewability above Moat industry averages, with in-app ads that are virtually buffer-free. As a Moat partner, InMobi specializes in mobile video formats that build brand awareness, drive user engagement, and achieve top-of-industry standards for viewability and completion. Get in touch with an InMobi video expert for your free viewability consultation — fill out the form at right! InMobi's speciality is VAST mobile video that loads within the device's native video player, resulting in virtually buffer-free mobile video. Faster-loading video means more real customers are watching your ads. That means your human and viewability % is much higher. * Moat Q4 2016, Engagement measured as CTR. Indexed CTR = (CTR/Global Average Video CTR)*100. Global Average Video CTR Index = 100. Integration types can be – SDK, API and Native in-app video. Based on H1ʼ17 data from the InMobi network. $25B was potentially wasted in ad spending in 2016, due to ads that weren't viewable. By integrating the deviceʼs native player, we can precache video and deliver a buffer-free user experience that effectively engages your customers. The number of digital video viewers is set to increase by 10% between 2016 – 2020 to reach 235.9 million. 2x viewability and increased mobile video performance with InMobi — say goodbye to buffering video. Achieve 0.06 seconds load time for your mobile video campaigns with InMobi's VAST video solutions, compared to 2.6 seconds with VPAID. As a Moat partner, our creative capabilities will help you reach new audiences, tailor ads to the right audience using unique device data, and convert customers with engaging rich media.